Our Vertical Sliding Aluminium Windows incorporates the traditional styling of wooden box sash windows with the advantages of a thermally broken aluminium profile. 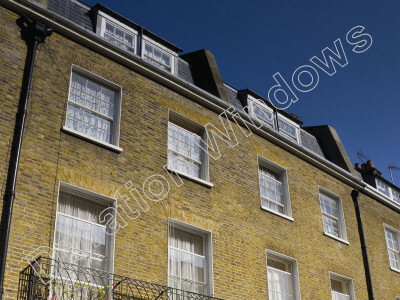 A stylish, low maintenance and authentic sash window that is suitable for use in heritage and conservation areas, or where Georgian and Victorian architecture is predominate. Why not see these windows for yourself. Our aluminium products are all painted in a hardwearing, maintenance free, polyester powder coat paint. The paint finish is built to last and baked hard onto the aluminium. 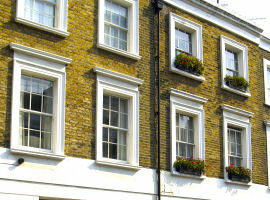 As a result these aluminium sash windows can come in many different colours and a ten year guarantee. 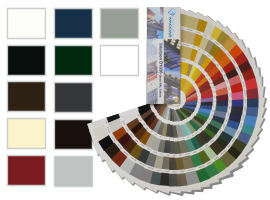 They are available in a standard white, our comprehensive KL colour range or any of over 200 RAL colour finishes. We have designed our Royale Sash Windows specifically to replicate the appearance of traditional box sash windows - providing a cost effective & low maintenance alternative that will retain the character of your property. It incoporates sash horns, slim 18mm sealed units and a putty-line / chamfered sash detail - all with a view to making these windows as authentic as possible. We also have a ‘Hammerite‘ style textured paint that has a rustic finish, which gives a more authentic look. You may wish to restrict the opening of your sash windows, perhaps for health a safety reasons. These windows come with an option for concealed Weekes catches, which act as Limit Stops (Travel Restrictors). These Limit stops are clean, discreet and unobtrusive and you can choose to have your windows manufactured to restrict the clear opening to any given height. Our Royale Sash Windows have a wide range of traditional hardware options available to dress your windows, including key locking Fitch Catches, Ring Pulls, Tilt Knobs, D-handles and Scroll Lifts (Sash Hooks). All hardware is available in a range of different colours. Available colour are: White, Gold, Chrome and Brushed Stainless Steel. Our Royale Aluminium Sash Windows have been designed to be very slim with meeting rails at just 42mm and double glazed sealed units of just 18mm, resulting in slim sliding sashes with jamb sight-lines of 88.5mm. When replacing existing timber sash windows it's important that the replacement windows are nice and slim, in order to maintain the character and integrity of your property. Sash horns are available on our Royale Sash Windows. Sash Horns were an integral part of Traditional sash windows, designed to strengthen the joints and prevent the sashes being opened too far. Although redundant on modern windows, they are still a fundimental feature of the aesthetic appeal of the traditional box sash, and are therefore still used when replicating the appearance of original sash windows. This window system is very thermally efficient and meets Doc L of the Building Regs. It is suitable for New Build as well as Replacement and Refurbishment projects. It has a 126mm fitter friendly outerframe with a double polyamide thermal break and uses 18mm krypton gas filled sealed units to achieve excellent U values and Window Energy Ratings (WER) as high as B. 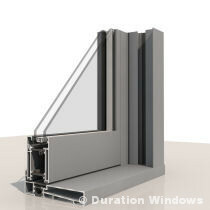 The glass for our sash windows is slim 18mm krypton gas filled sealed units. 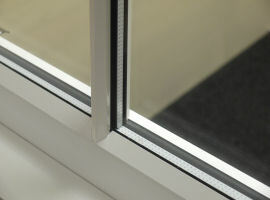 You can choose between a wide range of different glazing options, including our unique fitter friendly clip-on A-shapped astragal bars, used to replciate Georgian style windows. 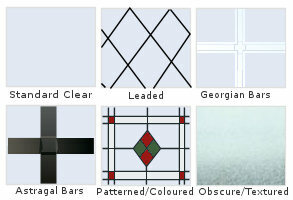 Other options include square or diamond leads, patterned / decorative glass, obscure and textured glass. A deep bottom rail is available for our Royale Sash windows. Traditional Box Sash Windows had deep botom rails to compensate for the slopping cills and excentuate the slim lines of the horizontal meeting rail, jambs and head sections of the sliding sashes. This is a feature that is indicative of any authentic sash window and makes our sash windows very sympathetic to the originals. 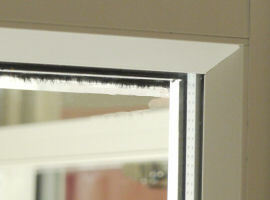 Both the top and bottom sliding sashes can fully tilt-in as standard. This allows quick and easy access to the external glass for cleaning. 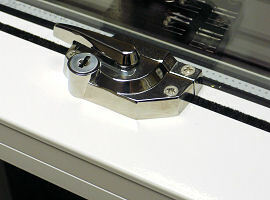 To tilt one of the sliding sashes simply pull both the tilt knobs directly away from the outerframe to release the tilt latches, and the sash will be free to tilt. 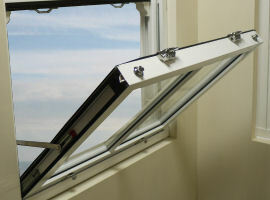 The amount that the sashes tilt inwards can be restricted with the use of tilt restrictors. 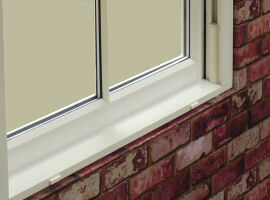 Our VS Plus Sash Windows have a square, clean and simple design that is suitable for most applications. It is perfect for use in all types of modern architecture and provides a low maintenance alternative to timber sash windows.The operation of the VS Plus is easy and relaible, providing excellent natural ventilation, which makes it highly suited to high occupancy or commercial buildings. These windows come with a range of robust and attractive hardware options and features a 'tilt in' operation to facilitate cleaning of the external glass. 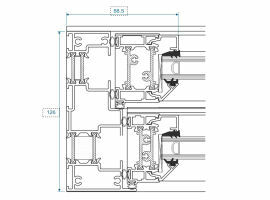 The VS Plus also features concealed drainage and an attractive concealed coupling option allowing two VS Plus windows to be seemlessly coupled together. 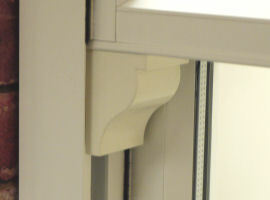 Replicates a traditional box sash window. Slim or deep bottom rail - 55mm / 101mm. 130mm front to back (thickness). 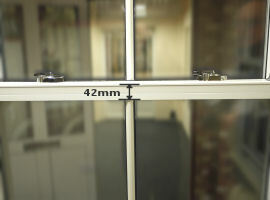 Sight lines - 89mm or 96mm jamb / 42mm midrail. Add flat shaped astragal bars for that period look. Tilts in for easy cleaning. 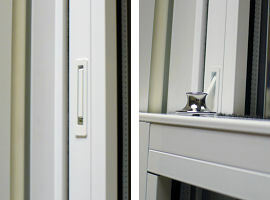 Finish your installation with our unique colour matched aluminium quad trim. Please note: dual colour is not available on this product. Testimonials	Delivery Find A Fitter Why Aluminium?